Any amount coming to your institute is always an income; but at times, you might have to pay tax and cess for the amount that you receive. It really becomes a tough task when you have to calculate the certain percentage on the amount every time it is received. But, when your school is powered by Fedena, you should not worry about all these trivial issues. The Auto Transaction feature of Fedena helps you set a percentage that you want to divide as a tax on the amount received as income. Hence, you enter the amount you received as an income, and go to report which will display the final income received after deducting the percentage of tax as expenses. One of the primary advantages of using this unique feature of Fedena is it automatically calculates the amount that is to be deducted from the total income received and is shown as expenses. All these are done without much interference of yours, other than creating a new auto transaction. Now, let us see how this auto transaction can be created and used to gain the ultimate benefit. Firstly, login to your Fedena account and go to ‘More’ and then to ‘Finance’ and finally to ‘Automatic Transactions’. 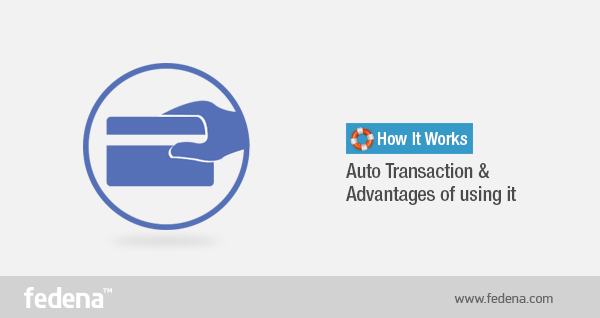 Once you are in ‘Automatic Transactions’, you need to create a new auto transaction. Write the category, percentage of amount to be deducted and also the description of the transaction you are creating. After creating a new transaction, you need to go back to ‘Finance’ and then to ‘Transactions’ to create a new income event and see how the tax is being deducted. Click on ‘Add income’ and you get a page where you have to fill in all necessary details in order to create the new income. When you ‘Save’, you are allowed to go back to ‘Transactions’ and get the report for which you need to select the time limit for which you need the report. You get the report that will show the tax or any cess has been deducted and the final amount that you receive as income. Thus, you have a smarter way to calculate taxes and cess to get the final income after deduction. Then, why use critical mathematical calculations for it?